I was very excited to learn that Christina Philippou, fellow book blogger, was releasing a novel of her own! Even more excited when my request to read it was approved by the publisher via Netgalley. I knew I was going to like Lost In Static from the very first page. We follow the stories of four fresher students as they embark on their first year at University. I liked Ruby, although the constant use of the word ‘mate’ was a bit much sometimes. I have known people who talk like that though. Ruby is a normal northern lass, a bit of a tom boy, into football and just wants to get on with University life. She soon falls for Callum though, which complicates things. Callum has a secret which, if leaked, would seriously put the cat amongst the pigeons. I quite liked Callum’s character. He was very believable as a typical lad, making the most of his University experience. Juliette also has a secret, one that really needn’t be though, in today’s society. However, not all families are as understanding and accepting as others. Juliette soon becomes firm friends with Ruby, but struggles with other relationships. Yasmine is one on her own, I did not warm to her at all. She sets her sights on Callum so is obviously jealous of Ruby and she is determined to find out Callum’s secret, at any cost. I haven’t been to University, so I can’t comment on the authenticity of the general behaviour of these teenagers, over their first few terms, but it did make me kind of hope that my children decide they don’t want to go! I loved the way this book is written. Four different characters, writing to four different recipients about the same situations, but obviously from their own perspectives. It was a very refreshing and enjoyable read. Fast paced and full of suspense. Very cleverly written. It’s quite hard to believe that this is Christina’s debut novel. Needless to say, I’m looking forward to what she will write next. Many thanks to Urbane Publications for my auto-approval status on Netgalley. I will be more than happy to recommend Lost In Static to anyone and everyone. It deserves every success. Sometimes growing up is seeing someone else’s side of the story. Four stories. One truth. Whom do you believe? Callum has a family secret. Yasmine wants to know it. Juliette thinks nobody knows hers. All Ruby wants is to reinvent herself. They are brought together by circumstance, torn apart by misunderstanding. As new relationships are forged and confidences are broken, each person’s version of events is coloured by their background, beliefs and prejudices. 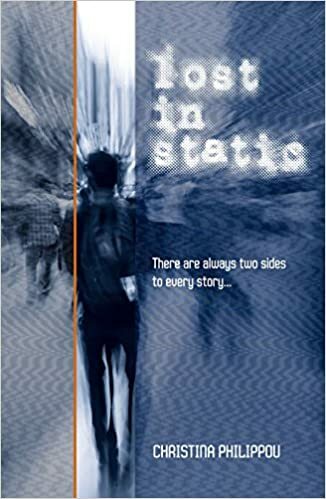 And so the ingredients are in place for a year shaped by lust, betrayal, and violence… Lost in Static is the gripping debut from author Christina Philippou. Whom will you trust? Christina’s writing career has been a varied one, from populating the short-story notebook that lived under her desk at school to penning reports on corruption and terrorist finance. When not reading or writing, she can be found engaging in sport or undertaking some form of nature appreciation. Christina has three passports to go with her three children, but is not a spy. Lost in Static is her first novel. Previous Article Added to my TBR list, September 2016…..